It's time to organize your closet. 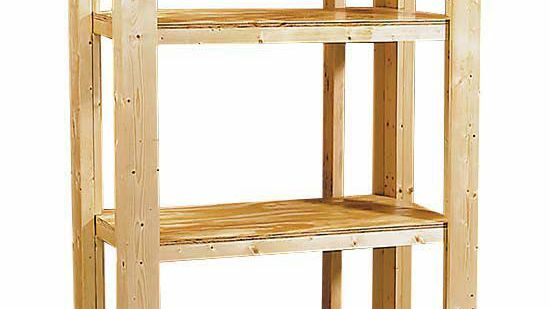 We'll show you how to build shelving that makes storing clothes and accessories easier than ever. 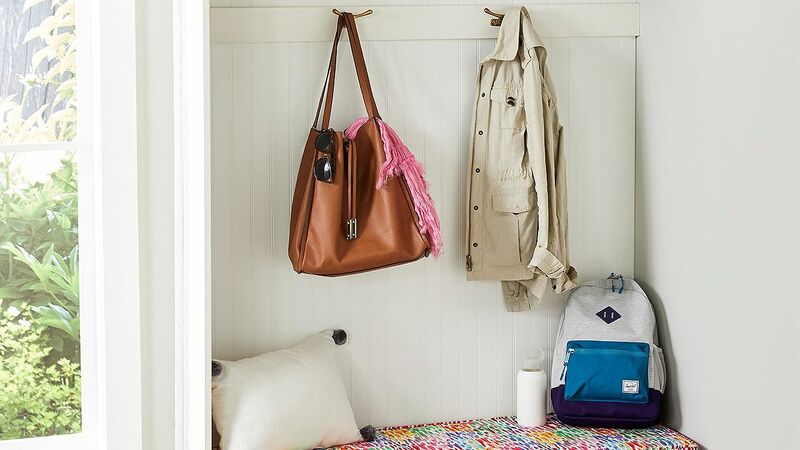 After assembling this organizer, you'll think you've doubled the size of your closet. 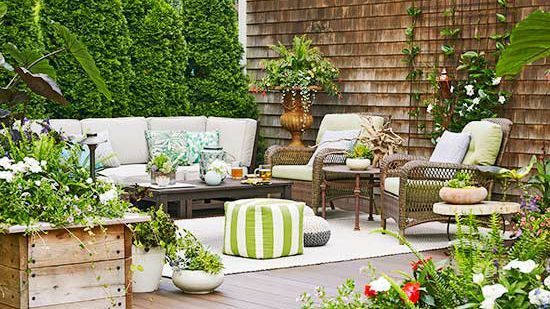 The key is efficient, accessible use of space. 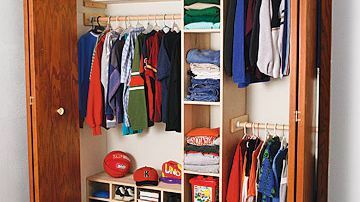 Instead of the usual single closet pole with a difficult-to-reach shelf, you'll have three poles at appropriate heights for shirts, pants, and coats. Instead of a jumble of shoes in the dark recesses of the floor, your footwear will be neatly stored in an easily accessible rack. 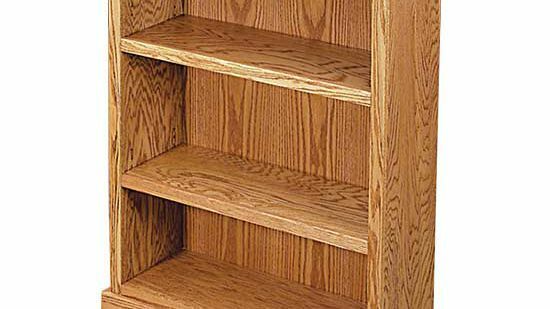 At the center of the organizer is a stack of narrow shelves perfect for storing sweaters. There also are divided accessory shelves to the left of the sweater shelves and another shelf over the shirt pole. The organizer shown fits a closet that's 7 feet wide and 8 feet tall. 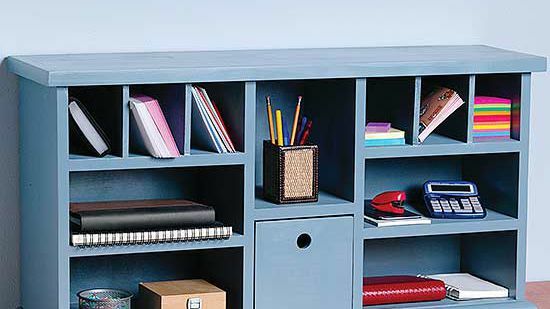 This organizer is made of birch plywood and has a clear satin polyurethane finish. Of course, you can stain the plywood first or use oak plywood for a different look. Birch plywood also looks great with a painted surface. 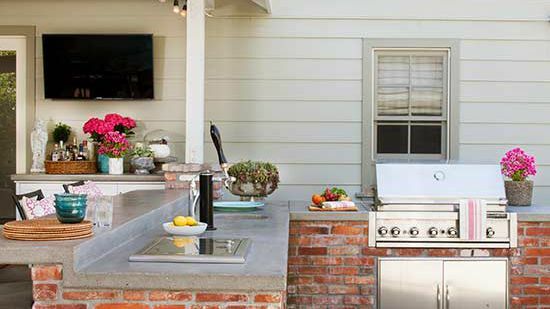 A semigloss paint will be more durable than flat paint. 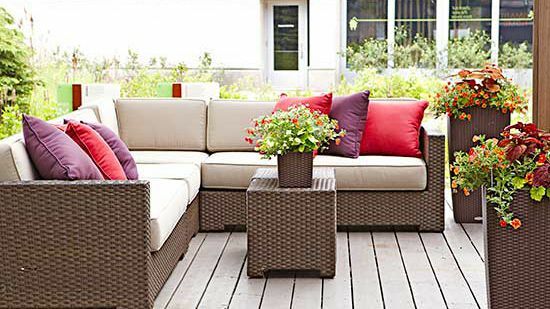 You'll need about 8 hours to construct the organizer, plus finishing time. Prep for the project by cleaning out your closet and gathering the necessary materials. 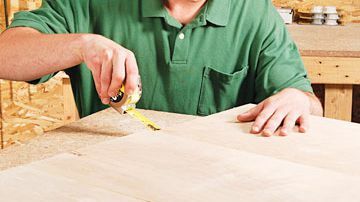 Editor's Tip: To cut a full sheet of plywood accurately and safely on a tablesaw, you must have a helper or support tables or rollers on three sides of the saw. 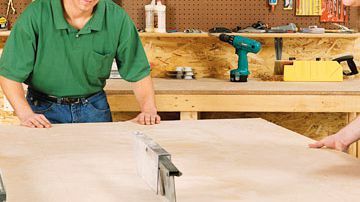 Even with a helper and extra support, a lightweight bench-top saw could shift dangerously during the cut. 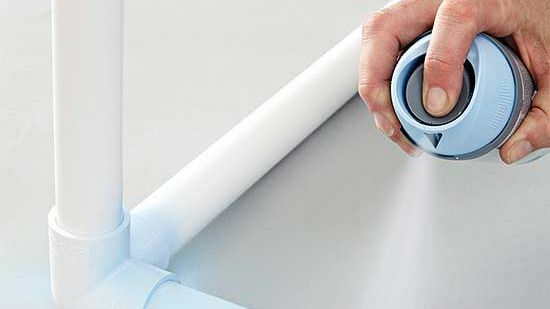 The solution is to snap a chalk line on the sheet for a rip-cut that's about 1/4 inch wider than the final width you need. 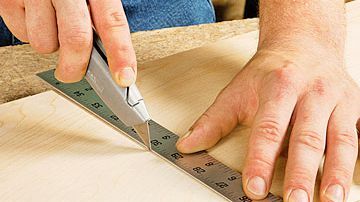 Cut along this line with a circular saw—you don't need a guide because this cut doesn't have to be perfectly straight. Then set the tablesaw for the final width and rip off the extra 1/4 inch. 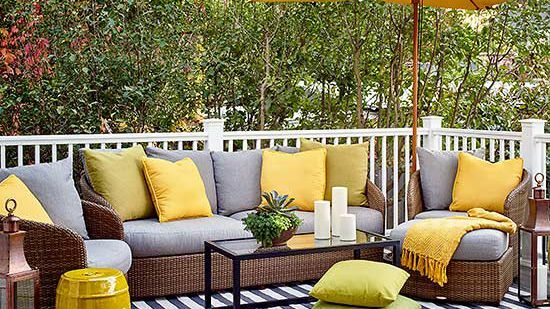 Download the Cut List for this Project. Crosscut all plywood parts to the lengths shown in the cutting diagram. 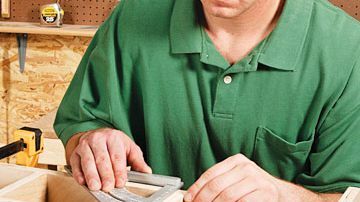 Attach a 2-foot length of 3/4-inch stock to the miter gauge to better support the plywood. Alternately, use a circular saw with crosscutting jig. Use masking tape to label each part as you cut it. When cutting hardwood plywood on a tablesaw, make sure the good side (the side that will show in the project) is facing up. 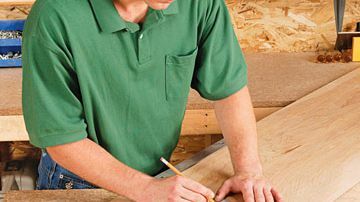 When cutting with a circular saw, the good side should be down so any tear-out that occurs as the saw teeth exit the plywood will be hidden in the project. 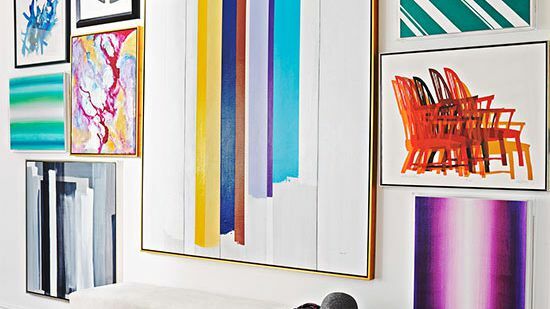 You might want both sides of the cut to look good (the shoe rack sides, for example). Or it just might not be practical to cut from the correct side. 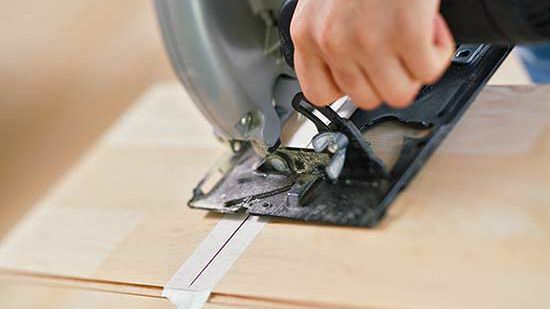 If so, place a metal straightedge along your cut line and use a sharp utility knife to score the cut line. 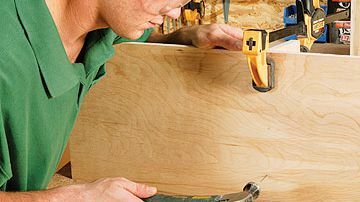 Make two or three passes with the knife, until you cut completely through the plywood's thin top veneer. Place the sweater divider sides (A) next to each other with inside faces up and tops and bottoms flush. Use a framing square to lay out lines for the bottom of the four divider shelves (C), as shown in the drawing. Apply glue to the top edges of the divider sides (A). Attach the sweater divider top (B) with 4d finishing nails. Glue and nail the sweater divider bottom (B) in the same way. 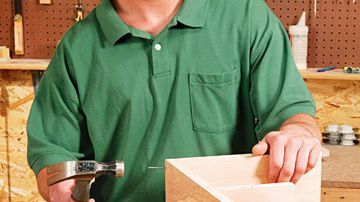 Use a framing square to check that the box is square before the glue dries. 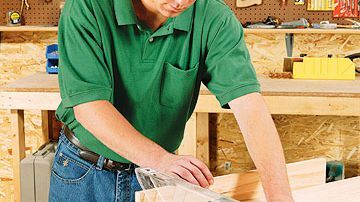 Screen molding covers seams where screening is attached to a frame, but it's also ideal for covering exposed plywood edges. 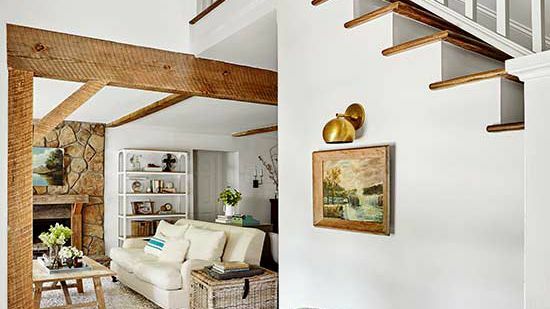 The molding is 3/4 inches wide to match the plywood, and you can choose from several profiles, including flat molding with rounded edges or beaded. Attach the molding with glue and 4d finishing nails. 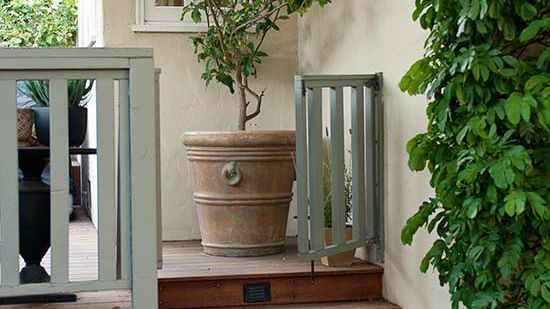 You can paint or apply a clear finish to match the project. 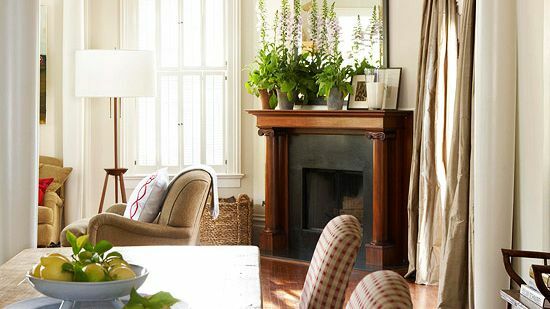 Or, make a decorative contrast by prepainting the molding to apply to plywood with a clear finish, or prefinishing to apply to painted plywood. Slip a sweater divider shelf (C) into place, carefully aligning its bottom to the layout lines. Attach it with 4d nails driven partway into the sides. Check for square and complete the nailing. Repeat for all the shelves. As you did for the sweater divider, lay the shoe rack top and bottom (D) and horizontal shelf (G) side by side to lay out the positions of the vertical dividers (E). Center the horizontal shelf so its ends are 3/4 inch from the ends of the top and bottom. Glue and clamp a vertical divider to the bottom. Make sure the divider is aligned to the layout, then secure with 4d finishing nails. Repeat for the other dividers. Attach the sides (F) the same way, making sure the ends of the bottom are flush with the sides. 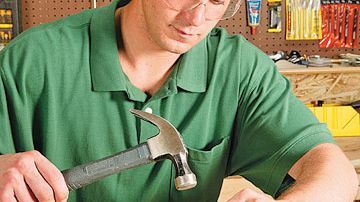 Apply glue on the ends of the shoe rack horizontal shelf (G), then glue and clamp the shelf to the three vertical dividers (E). Check for square and nail in place. Nail the sides into the ends of the vertical shelf. Glue and clamp one of the three remaining vertical dividers (E) to the top. Align it, then secure it with 4d finishing nails. Repeat for the remaining dividers. Apply glue to the top edges of the sides and the bottoms of the dividers you attached to the top. Nail the top to the sides. 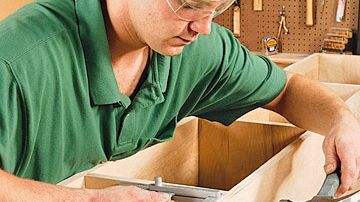 Make sure the assembly is square, then secure each top divider into the horizontal shelf by toe-nailing at front and back. Lay the top and bottom (D) of the accessory shelf side by side to mark the positions of the two vertical dividers (H). 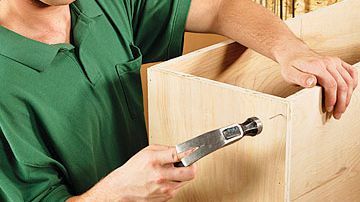 Glue and clamp the dividers in place and secure with 4d finishing nails. Cover all the front edges with edge banding. Apply finish. Center the sweater divider in the closet and install the shoe rack. 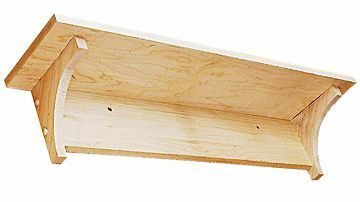 Lay out shelf-cleat heights on the divider and closet sides with a 2-foot level. 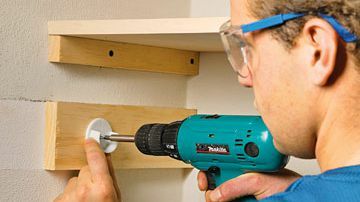 Locate studs in both sides of the closet wall with a stud finder. From 1x2s, cut six shelf cleats (I) long enough to extend 1 inch past the first stud from the closet's back corners or at least 10-1/2 inches long. 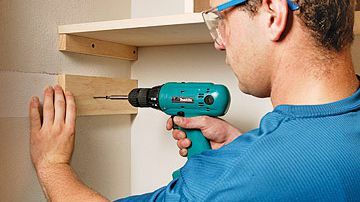 Attach the cleats with 2-1/4-inch drywall screws into the closet corner framing and first stud. Attach cleats to center divider with glue and 4d nails. 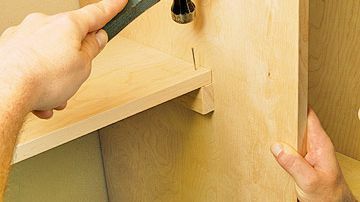 Install the right shelf and the left accessory shelf unit with two 4d nails driven down into each cleat. Fit cleats under the top of the accessory shelf assembly and install as you did the other cleats. 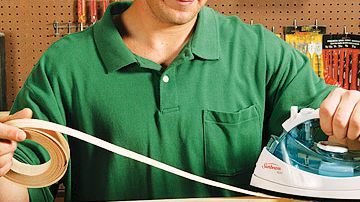 Cut six closet pole cleats (J) to the same length as the shelf cleats. Lay out heights for the cleats. 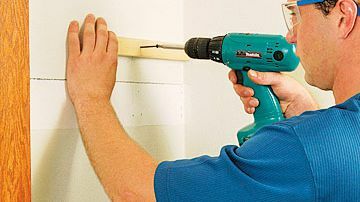 Attach with pairs of 2-1/4-inch screws into the wall studs and with glue and pairs of 4d nails into the divider. Fill the screw and nail holes in the cleats. Paint or finish the cleats to match the closet and divider. 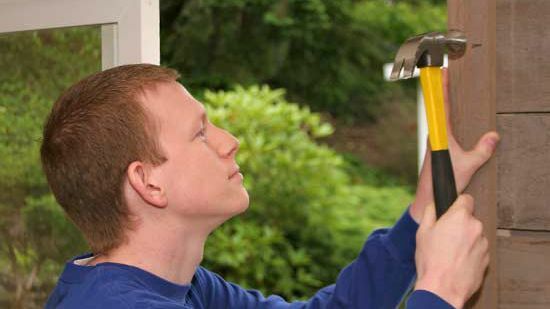 Install pole hangers with their center screws located 8-3/4 inches from the back of the closet and 1-1/2 inches from the cleat bottoms. Cut closet poles to length and install. When you build your own closet organizer, you are free to customize it to your needs, and even to your height. For example, the shirt pole is set 46 inches above the pants pole—enough room to hang long skirts from the pole. But for most shirts, you only need about 36 inches. So, if a short person will use the closet, you could set the shirt pole only 36 inches above the pants pole—at 68 inches instead of 78 inches. 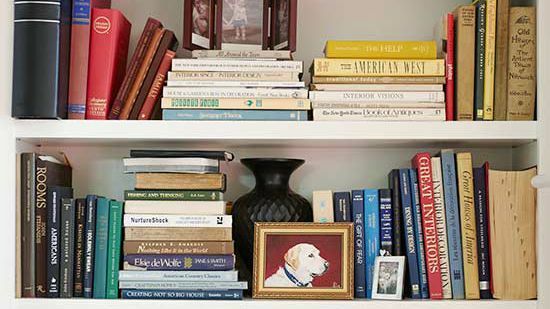 In that case, you could add a second shelf for items that are used infrequently. How difficult was this project?